A non-governmental organisation signed a long-term contract with Translators Family for the Russian into English translation of their website slovoidilo.ua. 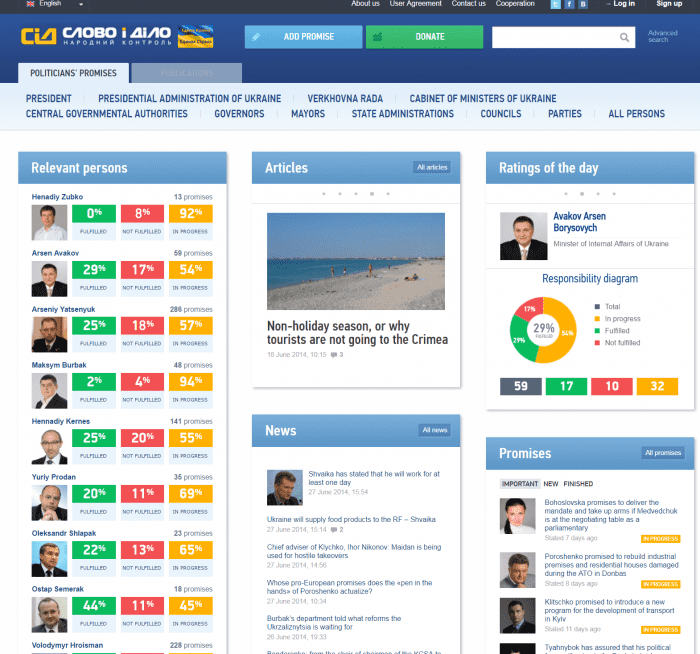 The website Slovo i Dilo is a system of responsibility ratings for Ukrainian state officials and politicians, based on verified facts and actual records of promise fulfilment. The project involved translation of articles, political histories, politicians’ promises, the website interface and daily updates on current political news. The first task was the translation of more than 2 million words of existing content, then later about 3000 new words per day. The project required a large team of translators with perfect English and knowledge of Ukrainian politics to meet short deadlines. As a news portal with daily updates, there was a requirement to publish the translation almost simultaneously with the source text. This meant an immediate response from us as the translation vendor and delivery of the translation within a maximum of 30-60 minutes after receipt of the task. The client provided the content in .xlf files with html tags, which required not only the use of special tools, but also customisation of those tools to process the tags correctly and prevent them from deleting or corrupting the text for translation. The project was made more challenging by the fact that the client decided to save money by forgoing translation and editing by a native speaker of English, instead choosing the more cost-effective option of having the translation done by Russian-speaking translators. Even with a pool of more than 100 Russian translators, we had to urgently hire more professionals who could manage the project. We chose our best translators with fluent or near-native English (such as Russian-speaking translators currently residing in the US or the UK), hired more translators who could fit the project, and gave them all test translations which were then checked by our native English-speaking editor. Meanwhile, our managers analysed the content for translation and compiled a style guide and glossary to ensure consistency of translation throughout the website. The style guide included the requirements for the English version of the site, preferred translations of typical phrases and structures, a standard style for the translation of dates, numbers, currencies, titles, company names, geographical names, institutions, political parties, personal names, organisations and so on. The glossary included the most used terms and phrases from the existing content. Given the two-million-word volume, we managed to achieve this using such tools as SDL Multiterm Extract and Apsic Xbench. Once the team was ready, we started translation. In order to provide high-quality translation despite the very tight budget, we worked almost without profit on the first stage. We involved an English-speaking editor for quality spot-checks of translations and for consulting with translators. Our Russian editor and QA manager with fluent English as well as good knowledge of politics in Ukraine reviewed the translations in detail. To solve technical challenges, our IT engineer set up filters for the CAT tool SDL Studio to process the tags within the files correctly. Thus we could provide translations with the same tags in the same places, allowing the translations to be published immediately. Our project management application allowed us to automate the work process and exchange files among the client, suppliers and managers. We set up an API to synchronise our application with the client’s website in order to receive new tasks quickly and easily. Once a new article was published in Russian on the client’s website, it was automatically sent to our application. Our translators, assigned specifically to this project, received the files for translation in the same instant and could start translation right away. Our project manager monitored whether the translations were accepted by the translators. Once the translation was completed, the translator uploaded the file into our system and it was sent to our editor. The editor did his job before uploading the file to his account. The file was automatically sent to the client’s website and published there without losing precious time and without requiring any human interaction. Thus we managed to meet both of the customer’s requirements: high quality and very quick turnaround times. 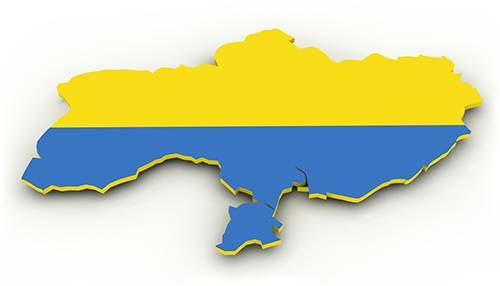 Unfortunately, after almost two years, the project was postponed in 2015 due to economic and political difficulties in Ukraine. Currently, the website has no English version. However, this project taught us how to translate under unbelievable time and budget constraints. Our team increased in size and we received invaluable experience with this project. The technical update of our project management application specifically for this task allowed us to work on more successful projects in the future.